SOMETHING was afoot in the magpie’s tree house. Unbeknownst to me, Mum and Dad were teaching Donald to sing. This became apparent one day during the bird’s early feed. Mum and Dad were perched on the balcony railing happily consuming their morning hamburger. As usual Donald and Daisy terrorized Squeaky and his family by running riot along the roof edge gobbling up any edible missiles aimed (but slightly off target) at squeaky and his crew. When the birds were all well fed and content. 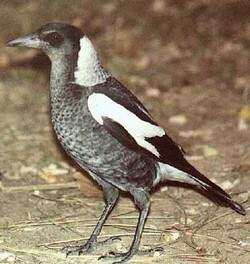 Mum and Dad raised their beaks to the sky as they often did and warbled as only magpies can. They sang in lovely harmony as if they had been doing it all their lives, (Ha!) when all of a sudden there was another, quieter sound. For a few moments I wondered who it was as it was a different song than what I had become used to hearing. It was sweeter and softer than Mum and Dad’s and even more melodic. I realized with utter astonishment that it was Donald. I was so used to his incessant squawking for Dad to feed him (as Mum had disowned both the brats once they were fledged, leaving feeding duties solely in Dad’s hands) and his annoying quacking around my feet as he begged for crumbs, but this was completely unexpected. It became obvious as time went by that Donald was absolutely thrilled with his ability to sing. He had found his calling so to speak and was I suppose, the Pavarotti of the birds. After that first time he was so in love with his new found voice that he couldn’t help himself but sing whether Mum and Dad were there or not. I hadn’t twigged that it was him at the start because he didn’t raise his beak to the sky like they did, but looked out over the landscape like a classical soloist singing to a packed audience in a nonstop warbling aria that enraptured all that were privileged to be in earshot. Not only did Donald sing his song while perched on the railing, but he could be heard all day, if not seen, as he plied his talent on the rooftops of distant houses and in the surrounding treetops. Daisy never cottoned on to this singing bit and during her time with us was never heard to utter one warble. All day his singing could be heard floating melodically in on the cool spring breeze. There was no mistaking it was Donald that was doing the singing for there was only one bird voice like his. Blog writer and author of Mind WorX-An Inside Story, a philosophical look into life's mysteries. Posted on October 5, 2011, in Natures Pecking Order and tagged Mother Nature, Wild Things. Bookmark the permalink. Leave a comment.